“Myth Makers, Start your engines!” is how every race in this game starts and it is a good way to build up the Myth Makers brand. Even if you don’t want to remember the title of the game, the choice is taken away from you as soon as the race starts. After playing Trixie’s little Candyland adventure, I realized that I was in for the long haul with this franchise. Super Kart GP was the next logical step on my Ninjabread man tour and this game manages to be somewhat decent. It’s still at a really low budget and the controls are a mess, but it feels a little more like an actual game than the other titles. There is even a lot of content here…even if it is rather tedious. There is no plot of course so you will want to just launch right into the races. You can play quick races against A.I. or a human player or you can go to the Grand Prix mode. Playing with friends is probably how you will have the most fun playing this title. That way you can poke fun at the title and really make the most of it. Otherwise, you’ll spend most of your time in the Grand Prix. There are 3 different speed settings and in those speed settings there are three different difficulty levels. After you get past that, there are 5 different cups for you to enter. Each cup has 4 stages and beating them all will give you a lot of bragging rights. That’s a lot of replay value for this kind of game right? The stages aren’t long and each one can be beaten in around 3-6 minutes, but they add up. If that’s about 12-24 minutes per tournament and there are 15 in all, that’s not half bad. There is one catch though and it is a fairly big one. There aren’t unique stages in the cups. From my estimation, there appear to only be around 4-5 different stages. One or two of them may have a night time variation that is virtually identical, but that’s about it. A bit of a shame if you ask me eh? That means that the cups are completely arbitrary and the only real benefit is having the personal satisfaction of completing them. Otherwise, you could just play the stages in free play mode and it’ll be around the same thing. I don’t see why the game couldn’t have added more stages. “Have you ever made a game, DReager1?” No, but I sure have played some in the past and many more stages could have been added imo. Ah well, let us move past that. One other aspect of replay value here is the fact that you can buy characters with the stars that you earn on the track. Run into as many of them as you can and hope that the computers don’t attack you or you will drop a lot of them. By the time you complete the first 5 stages you should have probably unlocked the first character. There are 5 unlockables I believe and getting them all wouldn’t take a crazy amount of time, but probably more than you are willing to put in. It’s also handled very oddly as the first character you unlock has the worst stats in the game. She has a 1 in two out of the three areas and a 2 in the other. Compare this to Trixie who is the main character and also has the best stats in the game. I believe that all 3 of her stats are maxed out, which is quite crazy. Granted, speed may not be all that important to you with this gameplay. It just means that you’ll be sliding off of walls and crashing a lot more. Slow and steady is enough to win this race. You hold the Wii remote sideways and try to steer as you go through the levels. The controls are easy as pie, but that doesn’t necessarily mean that they are good. The motion controls simply don’t work well with the Wii so you’ll struggle quite a lot as you play. It’s manageable, but I wouldn’t call it that fun at times. There are items like in Mario Kart (Same style of item block) and if you look closely, you’ll notice a lot of other things that they rip off from the series. The item variety is very limited though and while you also have a final smash, you probably won’t get to use it. It simply takes too many stars to use and by then the race is over or you’ll have fallen way behind as you try to collect them all. The soundtrack keeps on using the same tunes from the other titles like Ninjabread Man. People must have gone crazy while making these games since they will have been listening to the same song over and over and over again. Even if there was another tune or two in this game, you’ll quickly forget it as the main theme is burned into your mind. I’d say that the graphics are fairly decent compared to some abstract art, but I’ve seen Super Nintendo games with more creativity. You can always tell what is happening on screen, but that’s where the buck stops. Overall, While this racing game may not be a bad steal if you can find it for a few bucks, you may as well get a better one. There is no shortage to racing games on any console so this should be at the bottom of a very long bucket list. The only real incentive to purchase this is Trixie. She still grins a lot as always and even has her iconic “Take that Bustah!” lines sprinkled in. It’s hard to tell what she is saying at times since the audio quality isn’t that good, but I’ll assume that the game will get patched at some point if it gets a remake. There is more to do here than in the average game of Myth Makers and it just barely keeps Super Kart GP from falling into the negative area. 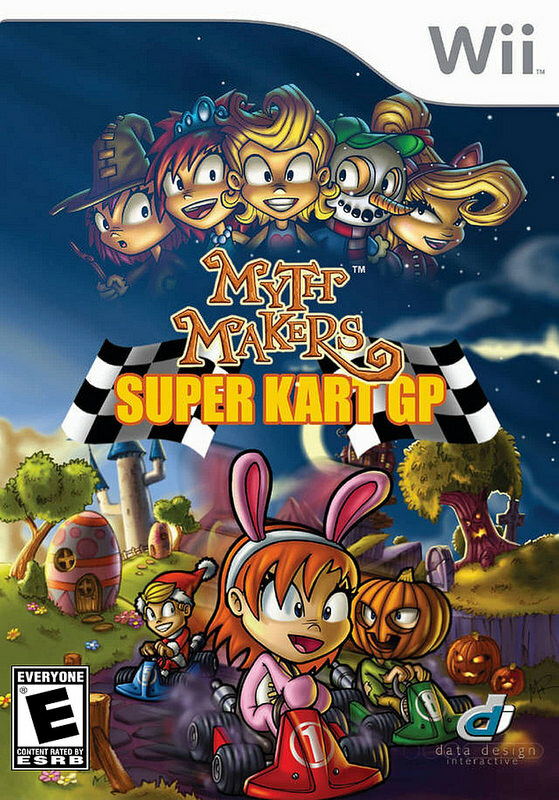 This entry was posted in 5 Star Games, Game Reviews, Games, Reviews and tagged Game Review, Myth Makers, Nintendo, Racing, Racing Game, Review, Super Kart GP, Trixie, Video Game Review, Wii by dreager1. Bookmark the permalink.